3-D Fishing Products Offers An Offshore Anglers Set of Great Tools! 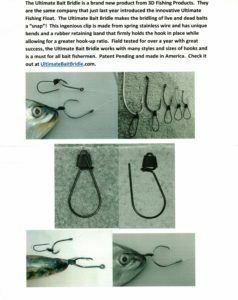 American Press Travel News- 11/30/2017–PSL, Florida–New Product Review- for the Ultimate Bait Bridle and Ultimate Fishing Float: Great for any offshore opportunities. These flats and bridles WORK for you! Highly recommended for sails, tuna, marlin species and tuna. Great for sending a bait out to the dolphin fish too!! 1.) Attaching the bridle to the hook first provides for easier opening and closing and assures that the rubber retainer will not dislodge. 2.) The bridles are made of spring stainless steel and may be opened as wide as necessary to accommodate the bait. They will retain their original shape when re-locked (closed). 1.) 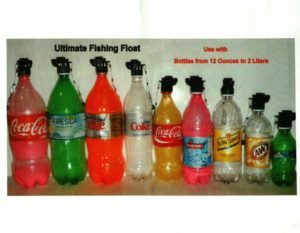 The floats work with soda bottles from 12 ounces up to two liters. (They do not fit on most water bottles.) Coke(r) bottles work perfectly – Pepsi(r) bottles have a slightly different thread design. A small piece of plastic wrap will seal a Pepsi(r) bottle. 3.) Use light sticks at night to clearly see bait position. 4.) Floats are infinitely adjustable – tighten or loosen depending upon weight, wind, line and desired release pressure. 5.) Floats remain in the upright position when in release clip. If float is lying on its side, it has released due to either an unseen fish bite or the need to tighten. 6.) Floats are constructed of ABS plastic and stainless steel and do not require rinsing or lubrication.